What a match – Michael and Eric came out with guns a-blazing. We enter FJ! with a total of $55,600, just $1,000 shy of the sum amassed by Arthur Chu, Julia Collins, and Ben Ingram in the first day of the last TOC Finals. Speaking of guns, the reason this is so late is my good friend Jacqueline (coincidence) organized a “murder mystery weekend” at an inn in the Catskills. It was perfect: the joint even had a billiards room. My character, Keith Brunette, ran a floating craps game. Mr. Body and I had a good relationship – he’d bring his friends to the game I’d set up in his LIBRARY, and he’d take them to the brothel afterwards to celebrate their wins or drown their losses. We had a good arrangement until he lost $10,000 one drunken evening (that’s a lot of money, particularly in 1933, when this game was set) and I sent a few business associates with a LEAD PIPE to convince him to start paying. Mr. Green was the guilty party. REVOLVER, BALLROOM. If Eric doubles his score, he’ll have 41,600. To cover this all-in wager, Michael will need to wager 13,000. Jacqueline, with less than the difference of their two scores, is out of contention. An incorrect response with that wager will leave Michael with 15,600. To stay above his total, Eric can wager up to 5,200. A successful doubling will put Jacqueline at 12,400. Michael could wager at most 16,200. If Eric makes the rational maximum wager of 5,200, Michael will need to wager 2,600 to stay above him. In that case, Eric would have to wager 10,400 and respond correctly. That’s worthy of an all-in wager, however. 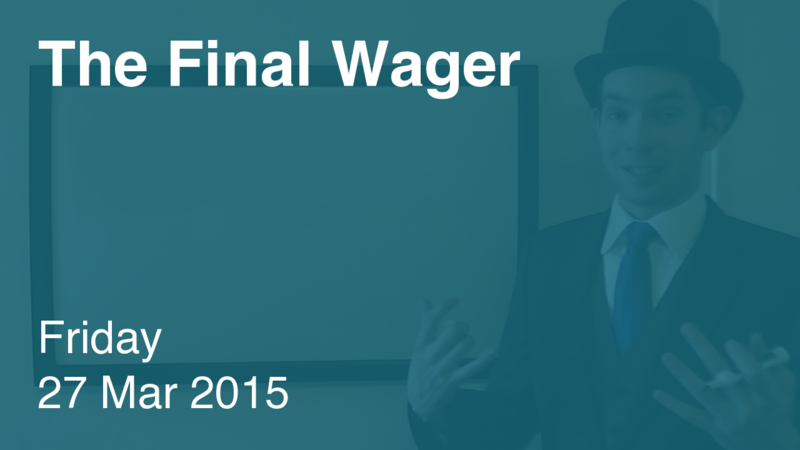 There’s nothing wrong with Eric’s wager, per se, assuming he meant to go “big” – he’s covering Michael’s low range. I just hate to see money left on the table. The last time two players entered Final Jeopardy! with more than $20,000 was Mark Japinga‘s second game, the infamous “Zelda” Final Jeopardy!, on July 12, 2013. At game’s end, our three players combined for a total score of $18,602. Had all three responded correctly, the total would have been $92,598. For those of you who do crosswords, this Final clue was a slam dunk. One slight way that Michael’s wager could have been better (at least $600 less): If Eric bets just enough to cover Michael’s zero bet (which is a possibility) Michael unnecessarily loses if they both miss (if you’re the leader in a 2/3-to-3/4 scenario you ought to keep your cover bet small enough not to open that door for your opponent). Great point, Kelly – now that I’m fine with people going bigger than the bare minimum, there are a few situations I haven’t considered. This is one of them. I’ll point this out next time it happens. Thanks for catching it. Keith, how many times have two people gone into final with 20,000+?